With a title like Sharknado, this movie already has one strike against it. That it’s also made by The Asylum for the SyFy Channel makes two more. And… it’s out! Any movie should be given the benefit of the doubt. As the saying correctly has it, don’t criticise what you haven’t seen. But there are times when to say this would be wrong, when the whole concept of a fair hearing, and leaving your prejudices at the door, is completely, totally and utterly a lost cause. And ladies and gentlemen, here is one of those times. Let’s not beat around the bush: Sharknado isn’t so bad it’s good, it’s just plain awful, and in ways that you can’t anticipate. It takes the idea of low-concept movie making to somewhere below the acceptable nadir, and stakes its claim as the most inept, appalling movie ever made. There are levels of bad this movie practically races past in its efforts to be dreadful. If there was a clear intention to make the worst movie possible, and the filmmakers actually sat down and planned it to look and sound like this then, ladies and gentlemen of the jury, there can be only one verdict handed down this day: life imprisonment without hope of parole. Beginning with a confusing scene set aboard a fishing boat, Sharknado sets out its stall of fake goods from the start. A storm hoves into view and before you can say “holy flying sharks” the crew are all eaten by sharks that are being thrown about like tooth picks by the violent winds. The movie then switches focus to the California coastline and bar owner/surfer Fin (Ziering). When sharks that are attempting to outrun the storm – hey, I’m guessing here – start chewing on the local surfers and swimmers, including Fin’s pal Baz (Simmons), Fin, along with feisty bar girl Nova (Scerbo) and permanent lush George (Heard), decides that everyone needs to get to higher ground, as it’s a sure thing the storm – now upgraded to a hurricane – is going to cause untold devastation and, wait a minute! Aren’t those sharks swirling around in the hurricane? And aren’t they liable to just fall out of the sky at any minute and chomp on whoever’s unfortunate to hang around for dinner? Just writing that synopsis is difficult enough. Seeing Sharknado in all its non-glory is harder still. Yes, The Asylum make bad movies, yes the SyFy Channel is home to some of the worst monster mash-ups in recent history (Sharktopus (2010) anyone? ), but this is just the worst kind of cynical movie making, with a script that makes no sense at all, where the characters behave like they were lobotomised a short while before everything went wrong, where the direction has all the style and originality of a toddler’s tea party, where the cast struggle and then give up quickly with any attempts at real acting (“just say the lines, keep your head down and it’ll all soon be over”), where the woeful special effects plumb new depths of ineptitude, where cutaways and inserts provide most of the photographic style, where the editing seems less fluid and more cut and splice with a hacksaw, and where the occasional gore effects are – surprise! – the only halfway decent aspect of the movie. 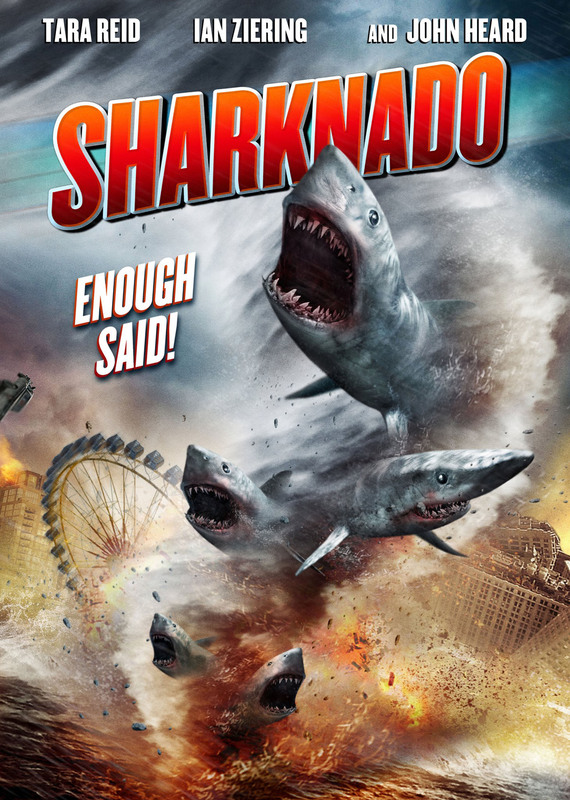 Sharknado is so bad it’s appalling, and so appalling it’s devoid of any worth at all. If you have to watch Sharknado, and I suspect there are plenty of you out there for whom this will be as much a challenge as a must-see, then take this one piece of advice with you into the living room/lounge/den/bedroom/wherever: have no expectations whatsoever; that way you’ll survive the experience relatively intact. Rating: 1/10 – saved from my first ever 0/10 rating by the acceptable gore effects (too few and far between though); atrocious, incompetent and utterly irredeemable as cinema, all those involved should hang their heads in shame.